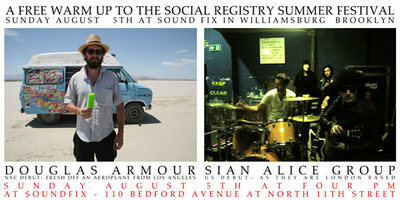 This Sunday (August 5th) Sian Alice Group and Douglas Armour will be playing an in-store at Sound Fix records in Williamsburg, Brooklyn. Sian Alice Group are flying in to town from London, and Doug from LA, for our Summer Festival on August 11th and 12th and this will act as a warm up of sorts. This is a FREE event so there really is no reason not to go. Sian Alice Group's 7-inch for The Social Club, Nightsong, is available in our store now, and Douglas Armour's 7-inch, Prince of Wands b/w Away, which comes out on August 7th, is available for pre-order. NME called Nightsong an "atmospheric, so long its split over two sides slice of six in the morning wonderment" and bestowed upon it the honor of "Vinyl of the Week." We expect Doug's release to receive similar honors.